Pharaoh Seqenenre Tao II died from multiple ax wounds Public domain / Catalogue du Musee du Caire (Royal Mummies section), published in 1912. Royalty are known to have gone into battle. For instance, Prince Andrew, during the Falklands War, and Prince Harry, in Afghanistan, have served with British troops. "I can't see any reason why they wouldn't four or five thousand years ago as well," he said. Boatright analyzed 125 Bronze Age weapons from Egypt, including daggers, swords, arrowheads, axes and spears. He also reviewed reports on 350 additional weapons from that period. Many of the artifacts had been robbed from tombs and archaeological sites more than 100 years ago, and were eventually acquired by museums or collectors in the 19th or early 20th century. "There's very little evidence to suggest that they would [belong to] people who were necessarily the average citizen," he said. "A couple of them actually have been linked to tombs in the Theban acropolis, so linked to the Valley of the Kings." He used microscopy and other lab analyses to look for evidence of how the weapons were used. "The funny thing about this whole process was that most of them seem to actually have the capacity to be used. There are very, very few that seem to have any ornamental or purely ritualistic context," Boatright said. Not only were they able to be used in battle, it seems about half of the 125 weapons studied showed evidence of wear and tear, suggesting they were actually used. Some of them, such as an ax with a dent in it, are obvious, while others are more subtle, like small nicks on the edge of a blade. The evidence suggests that elite members of Egyptian society may have gone into battle or executed prisoners personally. "I think there's an argument for it. Whether they were actually in the middle of the battle, or standing to one side, remains to be seen," Boatright said. One interesting artifact he studied was a bronze dagger that archaeologists believe may have belonged to Kamose. It was possibly used to avenge the death of his father, Pharaoh Seqenenre Tao II. The mummy was discovered by Egyptologist Gaston Maspero in 1886. Upon unwrapping the mummy, he found that the king had died from multiple ax wounds. 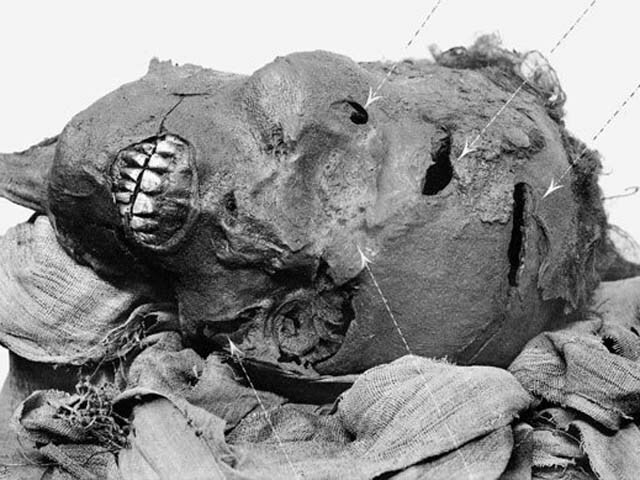 "It is not known whether he fell upon the field of battle or was the victim of some plot; the appearance of his mummy proves that he died a violent death when about 40 years of age. Two or three men, whether assassins or soldiers, must have surrounded and despatched him before help was available," Maspero wrote in volume four of his 1901 book, "History of Egypt, Chaldea, Syria, Babylonia and Assyria" (Optal eBooks, 2009). Seqenenre Tao II lived 3,500 years ago, at a time when much of Egypt was controlled by the Hyksos, a people from Asia who ultimately killed Tao. The dead king's son Kamose took up his cause, campaigning against them. "It's quite a long dagger, actually it borderlines on a sword," Boatright said. Upon examining it, Boatright found groove marks on the blade and tiny nicks on its edge, evidence suggesting the weapon was used. "It could be something that's been used by Kamose to attack someone, or something used on a daily basis." Given the violence of the period Kamose lived in, Boatright believes it is possible that Kamose used the dagger against another person, possibly to avenge the death of his father. "It easily could have been, bearing in mind the state his father was found in; Seqenenre Tao, his body was totally and utterly bashed into a pulp before he died," Boatright said. The research was presented last year at the third annual British Egyptology Congress at University College London. An article was also published at the same time in the journal Archaeological Review from Cambridge.